Ounce for ounce, this method will make your lean muscle stronger than taking the lighter route with your reps—here's how to do it right. Heavier reps make stronger muscles. Full stop. "If you want to optimize the amount of strength you're building, then training with lighter weights won't cut it," says Nathaniel Jenkins, Ph.D., an exercise scientist at Oklahoma State University. His research found that exercisers who lifted heavier weights to failure for three sets of low reps and those who lifted lighter weights to failure for three sets of high reps saw similar changes in muscle size. "But heavy lifting caused greater increases in strength," Jenkins says. That's because heavy loads more effectively stimulate your motor neurons, cells that send electrical signals to muscles. As a result, you're training your central nervous system to generate more force from your muscles. To reap the benefits—which you'll feel in everything you do, from taking HIIT class to schlepping heavy bags—you'll need to include heavy-load training, at weights of at least 75 percent of your one-rep max, Jenkins says. ICYDK, your one-rep max is the heaviest weight you can hoist once, and a key way to measure your strength progress. See how your strength stacks up against these markers, based on a 30- to 39-year-old, 140-pound woman from the American Council on Exercise. Start with a set of weights that is a little heavier than what you're used to. If you're still able to do the last four reps at the same speed you did the first eight, go for more weight next time. Want to go for your one rep max? Keep these safety tips in mind before you go that big. Your gym almost certainly has a Smith machine—the standing one in which an attached barbell slides up and down along a set of vertical guides. Use it as training wheels. 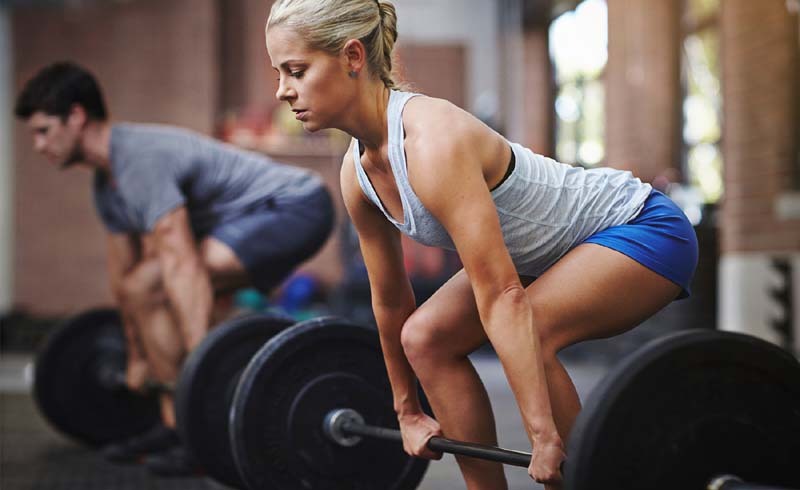 "For a back squat [in which the bar is across your back], stand with your feet shoulder-width apart, heels directly under the bar," says strength and nutrition coach Adam Rosante, creator of the Two Week Transformation program and a Shape Brain Trust member. "Keeping your chest up and core braced, lower as far as you can without losing the natural curve in your lower back. Drive up through your heels." Begin by squatting the bar alone to nail the form, then add your weight. If you need to bail in the middle of a lift, you can swivel the bar so the hooks "rerack" onto the nearest pegs. "Your core—including transverse [deep] abs, obliques, and lat [midback] muscles—protects your back, pelvis, and torso from injury as you lift," says Julie Erickson, the owner of Endurance Pilates and Yoga in Boston. She suggests doing these core moves even before you lift to prime your muscles: the Pilates roll-up (start faceup on floor, with your arms extended behind head, then roll up to a seated position) and bicycle crunches. "Then brace as you lift," she says. "Tense your core as if you're about to take a punch to the gut." Aim to rest a specific muscle 48–72 hours between heavy lifting workouts, suggests Cedric X. Bryant, Ph.D., the chief science officer of the American Council on Exercise: "The positive physiological adaptations of lifting heavy—the muscle building, the strength—all occur during recovery. If you constantly stress the system, you'll never actually recover, repair, and benefit."